As expected, the Philippine Opposition under the leadership of the Liberal Party (a.k.a. the Yellowtards) are screeching over the return of certain “evil” characters — former president now House Speaker Gloria Macapagal Arroyo for one. It’s déjà vu, they say — as if that, by itself, is an argument that supports the “evilness” they believe characterises the situation today. They are now throwing a monumental tantrum over what is, essentially, a failure on their part to stay on top of their political game. Instead of being good chess players, they’ve allowed themselves to be outmaneuvered by the “enemy”. The Opposition played really badly. 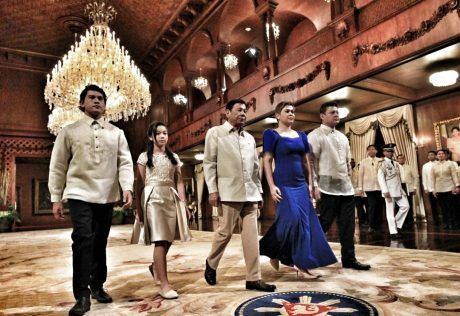 They accepted every gambit dangled before them by the government of President Rodrigo Duterte, swarming around and biting at every one of the outrage fads that “trend” on social media and quibbling over every spelling error and every blooper that blips on the radar they use to track the movements of their low-value targets. All the while, the political “maneuverings” they now brattily stomp their feet about in infantile anger went on right under their noses. What is remarkable is that every one of the “sinister” maneuvers the Yellowtards whine about today were conceived, planned, and implemented where they should be — within the framework of the law and within the offices that house legitimate democratic institutions (i.e. in courts and the halls of Congress, among others). Democracy and its processes were actually at work and these were used shrewdly by the camp of Duterte and its circle of allies to outplay the Yellowtards. The trouble with the Yellowtards is they had spent an inordinate amount of time and effort plotting extrajudicial and even criminal approaches to re-acquiring power. They continued to rely on their tired old “people power revolutions” that are essentially just garden-variety coup d’état disguised as prayer meetings. Rather than work with their duly-elected representatives in Congress, they deferred to the Cold War relic of a notion they call the “parliament of the streets” as a source of legitimacy. They relied on slander, lies, and good old-fashioned appeal to emotion, styles that their chosen “leaders” were all cut from the same mold to exhibit: “vice president” Leni Robredo, never-had-been-chief-justice Lourdes Sereno, convicted mutineer Antonio Trillanes, and accused drug lord coddler Leila De Lima. The irony that flies over the pointed heads of the Yellowtards is that they are now the first to dismiss use of due process to get things done in favour of antics that are actually destructive to Philippine democracy. What the Yellowtards had neglected over two years of wasting time on 1980s-era political relics was the important task of winning elections and accumulating legitimate political capital on a 21st Century landscape. Rather than use social media as a platform for constructive discourse, they used it to keep the discourse stunted at infantile levels. This can be seen in how their most revered political bloggers found very few intelligent words to fill the commentary they issued before, while, and after Duterte delivered his SONA. Instead of working on forming strong coalitions amongst already-elected officials within Congress, they undermined the institution itself and dismissed it as a lost cause. Rather than recognise real achievements delivered by the government and contributing to enhancing these achievements and proposing additional innovative ideas to produce more and better results, they engaged in economic sabotage. This is not an Opposition Filipinos deserve. This Yellowtard-led sorry excuse of an “Opposition” is nothing more than a den of carpetbaggers loosely unified by no more than a hollow-headed hatred for Duterte. They have latched on to a lowest-common-denominator approach to seizing power — through dishonesty, inciting anarchy, and even through terrorism. This is a thuggish Opposition hungry for power and will not think twice to implement methods that could unravel the very fabric of Philippine society just to achieve their insidious ends. Under such a dysfunctional Opposition, Philippine democracy can neither evolve nor mature further. Those who do the right thing and work within its institutional frame are the ones who deserve to be lauded today. Filipinos no longer need those so-called “heroes” the Yellowtards keep pining about. This is because there is no longer any of that “fight” the Yellowtards imagine still exists. There is only work to be done to build a country. And for that sort of work, “heroes”, “martyrs”, priests, nuns, failed CEOs, and “professional activists” need not apply. Next Article Hate For Gloria Or Hate For Aquino Incompetency? Ganito daw ang nangyari bago mag SONA. Sec.Andanar: I’ll see what I can do..
Joyce Bernal: we can replace it with a small one like the compact Bose soundlink type speakers…. Bong Go to Digong: Mayor, pangit daw speaker say congress kailangan palitan Ng maliit, kailangan daw pati funding from OPS muna..
PD30 to Baste: hello Baste, tumawag ako dahil maingay daw masyado speaker sa congress, papalitan mo Ng mga maliit na Bose…. Baste: okay Papa…. Ayusin ko po agad..
Baste paalis na, tinawag ni Sarah..
Sarah D: hoy Baste saan na naman lakad mo, ayusin mo nga buhay mo…. Baste: Hindi, inutusan ako ni Papa, palitan daw yung speaker sa congress Ng Bose speaker na maliit…. Baste: okay pero pakisabi Kay Papa..
Sarah: ako Ng bahala…ora mismo! Cong. Florendo: Kung sinabi Ng Pangulo na palitan yung maingay na speaker eh mas mainam.. pero dapat Alam Ng mga kaalyado natin….pakitulungan mo na akong magtatawag….sigurado ka sinabi Ng Pangulo palitan ang speaker ha? Sarah. Oo man Cong, Florendo, sinabi kay Baste baga…. yun daw maliit na speaker. JOYCE Bernal to Andanar; bakit di napalitan ang mga speakers? Andanar: di ko Alam…pero sinabi ko kay SPA Bong Go. Sarah to Digong: Sabi mo raw .. palitan speaker sa house..
Credit goes to the original creator of this kwento. This is just a joke but I will not be surprised if the antis, the yellow and their equally stupid mainstream media people pick this up and reports it. That reminds me about Rappler’s fiasco with their fact-checking; it turns out to be a joke when they fact-checked a SATIRICAL article from Adobo Chronicles that even the author of the site told them that ‘they should go back to school to learn about satire’. That’s why Filipinos are terrible when it comes to satire and sarcasm. Masyado tayong balat sibuyas. We don’t need any SONAs; people have eyes and have brains. They can see if they are governed well, and can now think, if they are misled by their leaders. The Social Media thru the Information Technology, has made this, to happen in our country. Any “citizen journalist” can just log on, in his computer, and give his “two pesos” worth of opinion. They can debate , argue, rebut, with any high government official. Exposing them to incompetence, lack of knowledge, and just plain stupidity. Most of those high government officials and opposition leaders, are afraid to tangle with “citizen journalists” or social media people. The thinking of the YellowTard opposition, or any shade of opposition, is obsolete. They still have the knowledge that they can use: political slogans, rallies, parliament on the streets, propaganda machines, captive TV networks, like the ABS-CBN, GMA, fake news like the Inquirer and Rappler.com, etc.. Unless they can learn to give us, coherent programs/plans to improve our country and our lives; they will remain as irrational opposition parties. Thinking of impeaching Duterte and replacing him with the fake VP Leni Robredo, is no longer possible. Going to international agencies, to complain the behavior of Duterte, asking them to remove him, and replace him with yourselves is now laughable. Going to the U.S. / C.I.A , Sen. Marco Rubio, U.S. Dept. of State, requesting the removal of: Duterte , is just plain stupidity. U.S. Pres. Trump has many problems of his own. Thinking of coup d’ etat, like what Enrile and Fidel Ramos had done to the late Pres. Marcos is obsolete thinking. Duterte is tougher than Marcos Sr. The Opposition has to play the political game, that is attuned to the upgraded mindsets of most Filipinos, who are now relying on the Age of Information Technology. The fault of the opposition is : they are IN DENIAL, that the technologies of the Information Age, had reached our country ! Reality may not be what you want it to be, but it is the reality you now must face. You can deny this reality and try to wish it away, or you can accept it and not waste any energy on wanting it to be different.